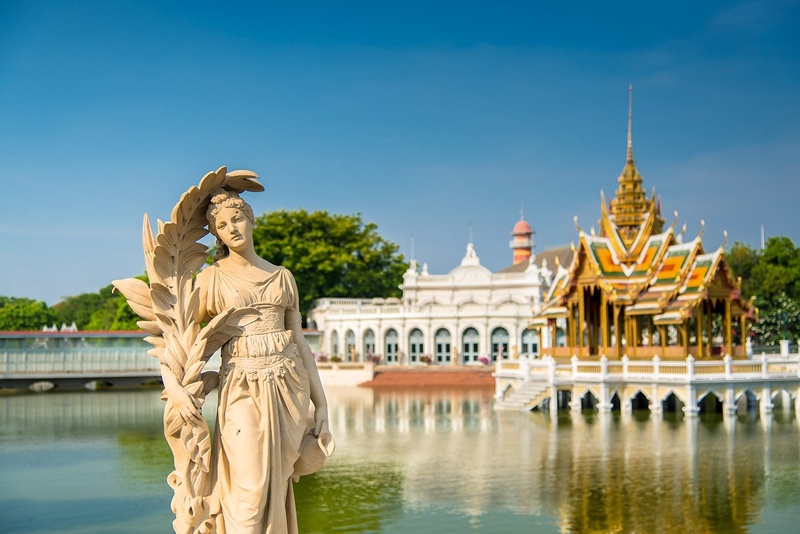 This Thailand classic tour conjures up images of spicy delicacies, majestic elephants, golden Buddhas, colorful hill-tribe villages and exotic hideaway. Begin with touring in Bangkok covering the most important temples. Learn about Buddhist practices and influences on daily life. 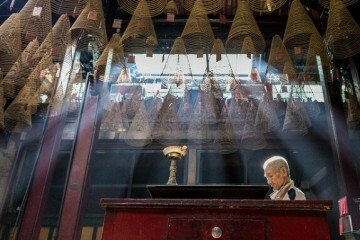 Hear monks chanting at a morning ceremony. 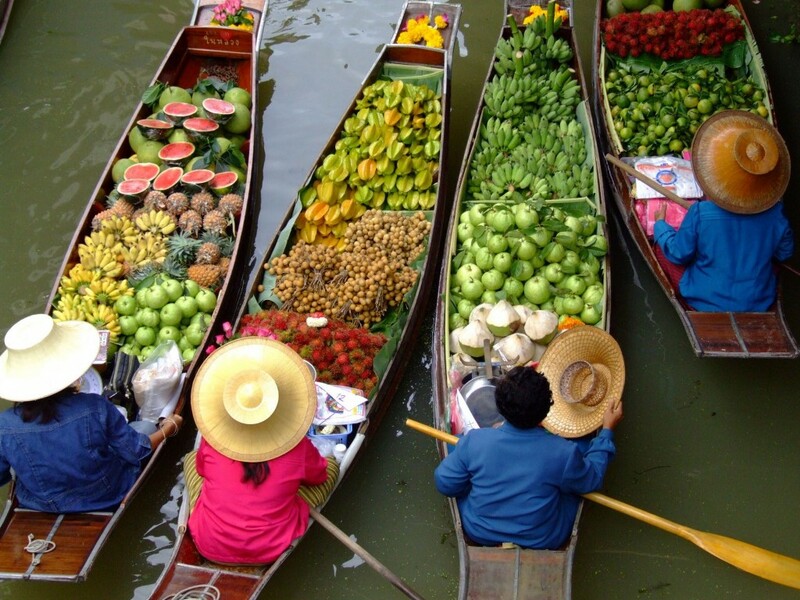 Explore colorful floating markets selling wares from boat to boat or boat to shore. Explore Ayutthaya‘s ancient ruins. 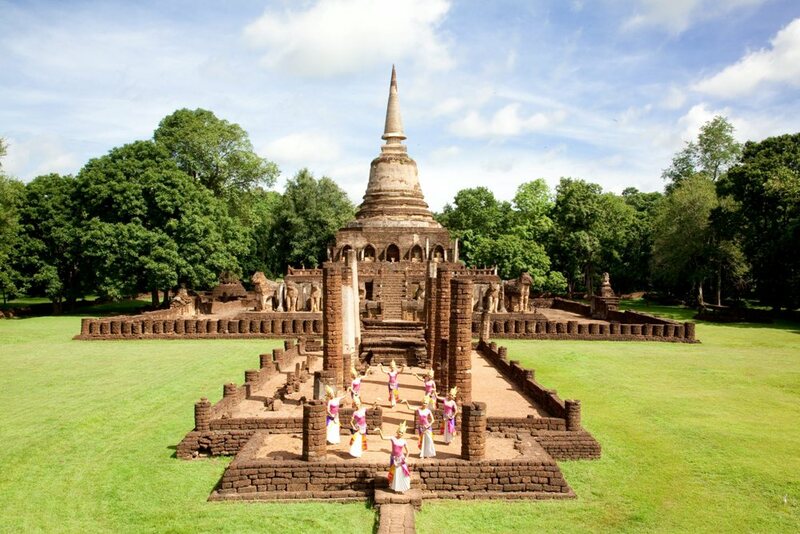 Step back in time in the ancient kingdom of Sukhothai. 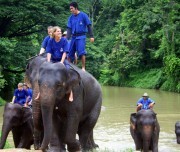 Visit an elephant center and support the rehabilitation of the endangered Asian elephant. Visit a local village for an authentic khantoke dinner. Get a blessing from a monk at the temple of Doi Suthep. 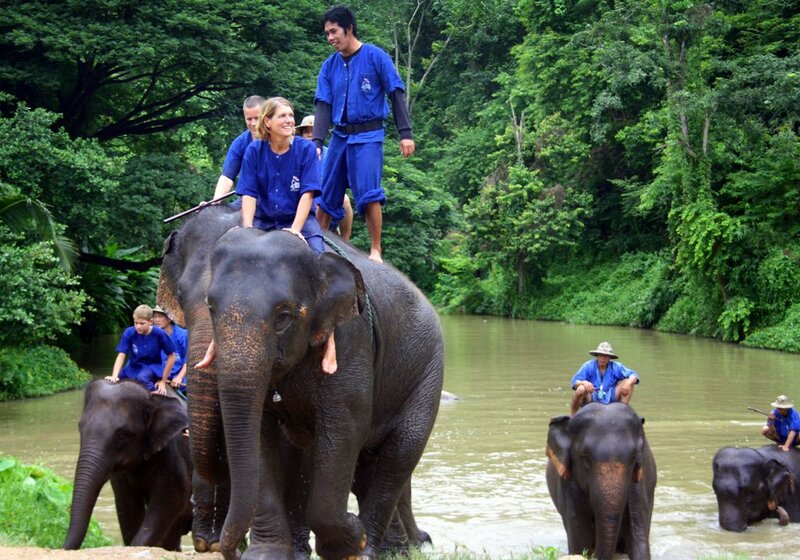 This is your chance to capture the adventure and essence of timeless Thailand. Arrival at Bangkok airport, meet our guide and transfer to the hotel for check in. Rest of the day is at leisure. Overnight in Bangkok. The city tour takes you through some of the most interesting parts of Bangkok, including stops at the Temple of the Reclining Buddha (Wat Pho), famous as the oldest and largest temple in Bangkok; the Temple of the Golden Buddha (Wat Trimit), the home of a 5.5 ton Buddha image, found when the port of Bangkok was being expanded and dating back more than 200 years. Visit to the Grand Palace, Coronation Hall and the holiest of all Thai temples “The Emerald Buddha Temple” (Wat Phra Kaew) where the replica of Angkor Wat and the late Ayutthaya-style murals on the surrounding walls illustrate scenes from the Ramayana are included in the temple’s compound. Overnight in Bangkok. This morning jouney leads you to Ayutthaya. Visit Bang-Pa-In, once King Rama V – this has some exquisite art works and the temples. Return down stream to Bangkok, enjoy the sights of the rural Thailand. In the evening arrival in Bangkok and transfer from pier to your hotel. Overnight in Bangkok. After breakfast, you will take a 120 km drive to the most colorful Floating Market in Thailand where boat people sell their wares from boat to boat or boat to shore. On the return, a stop is made at Nakorn Pathom to see the “Phra Pathom chedi” which is said to be the tallest Buddhist monument in Thailand. Visit a unique Thai Village at the picturesque Rose Garden Country Resort with an approx. 1.5 hrs Thai cultural shows where 150 performers introduce you to a Thai wedding ceremony, Thai boxing, sword fighting, classical dances and folk dances from all parts of Thailand. Overnight in Bangkok. After breakfast, transfer to the airport for flight to Sukhothai. Upon arrival, transfer to the hotel and check in. Tour to Sri Satchanalai Historical Park. 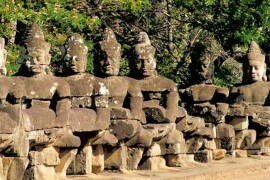 Sri Satchanalai Historical Park is located on the bank of the Yom River at Tambon Muang Kao, Sri Satchanalai County, only 55km from the town of Sukhothai. The ancient town, formerly called “Muang Chaliang”, was named “Sri Satchanalai” during the Phra Ruang Dynasty when a new administrative centre was established to replace Chaliang. This ancient town occupied more than 320 hectares (800 acres) of land. Of this, the 91- hectare (288 acres) area within the old laterite ramparts and the city moat is the focus of sightseeing in the historical park. Lunch at a local restaurant. Overnight in Sukhothai. Breakfast at the hotel before transferring to Lampang. Visit at Lampang Elephant Conservation Center to see elephant at works before continue to Chiang Mai. Lunch at a local restaurant. Upon arrival, check in at the hotel and free at leisure until the evening. Enjoy a superb Kantoke dinner while being entertained by a selection of traditional Thai culture and folk performances. Kantoke is the customary northern Thai style of eating with the food being served in large platters at low tables while you sit on mats on the floor. As you enjoy your meal, let yourself be entertained by a selection of northern cultural performances. Visit at Chiang Mai Night Bazaar for shopping before returning to the hotel. Overnight in Chiang Mai. You will have sightseeing tour to Meo Hill tribe village, since they originally migrated from South China, the physical features of the tribe are similar to Chinese. Traits similar with most hill tribes. Their houses are not built on stilt rather directly on the ground. Due to its proximity to Doi Suthep this particular village is slightly more commercial and less traditional. Doi Pui was once famous for opium cultivation. It’s 1500 metre above the sea level. Trip continues on to Wat Doi Suthep Temple. Drive up to see a panoramic view of Chiang Mai city. Lunch at a local restaurant. Afternoon, tour to San Kamphaeng district, heart of the silk and cotton home industries, to witness the fascinating process of making and weaving these popular fabrics. Continue on to the Bor Sang, the umbrella village, where the delicate Thai paper umbrellas are produced and hand-painted. These are modeled on the Sawankhalok pottery that used to be made hundreds of years ago at Sukhothai and exported all over the region. With its deep, cracked glazed finish the style is very distinctive and some pieces are exceptionally beautiful. Last but not least, stops to observe the intricacies of both lacquer ware and silverware craftsmen. Overnight in Chiang Mai. A thrilling boat ride along the Mae Kok River ends with a visit to a traditional Karen hill tribe village. The Karen originated in Burma and the various combined groups form the largest hilltribe population in Thailand, numbering about a quarter of a million which amounts to almost half of the total Thai hill tribe population. Overnight in Chiang Rai. 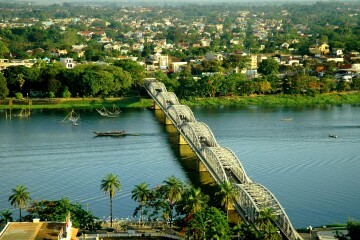 Visit to the infamous Golden Triangle renowned for centuries as the centre of the opium trade. From a hill top viewpoint, marvel at the splendor of the mighty Mekong joining with the Ruak and forming the actual “Triangle” with Laos Burma and Thailand. Lunch at a local restaurant. 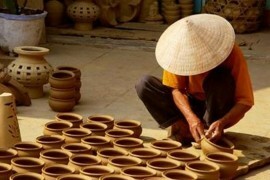 Continue to Mae Sai one of the biggest border market where you see the varieties of products brought from China, Myanmar and Laos such as clothes, local foods & local beverages, stone, jewelry, jade, local handicrafts, and etc. Return to the hotel and free at leisure. Overnight in Chiang Rai. Free at leisure until transferring to airport for flight back to Bangkok then take your connecting flight home. End of services.